Members of Bayou Cirque performing at a recent event in North Boulevard Town Square. Photos by courtesy Bayou Cirque. Over the last few decades, Cirque du Soleil has revolutionized the concept of the circus with its emphasis on awe-inspiring performance art, acrobatics and experiential storytelling. Now, a local cirque troupe is following that blueprint with the same pulse-pumping theatrics on a smaller scale right here in Baton Rouge. The group, Bayou Cirque, includes performers with a wide range of unique talents. 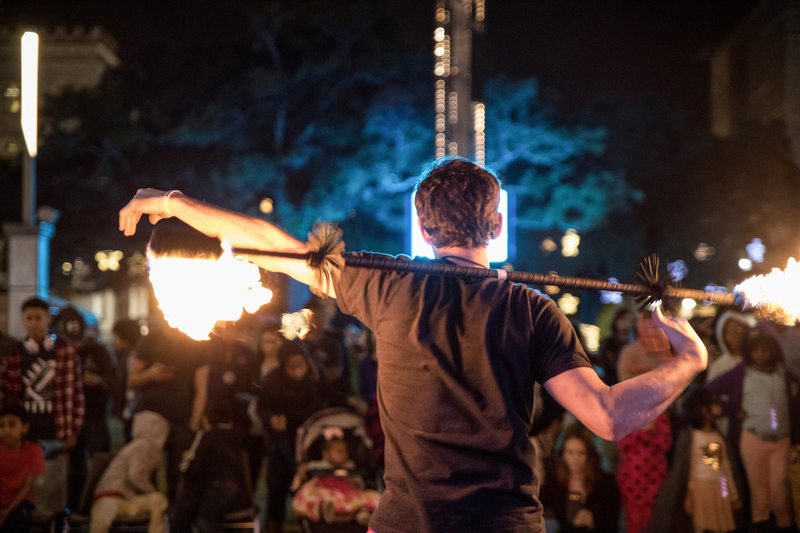 At a typical Bayou Cirque performance, you might see a performer twirling a flaming baton or walking precariously on a giant globe, while other acts might breakdance, juggle, jump rope and more. 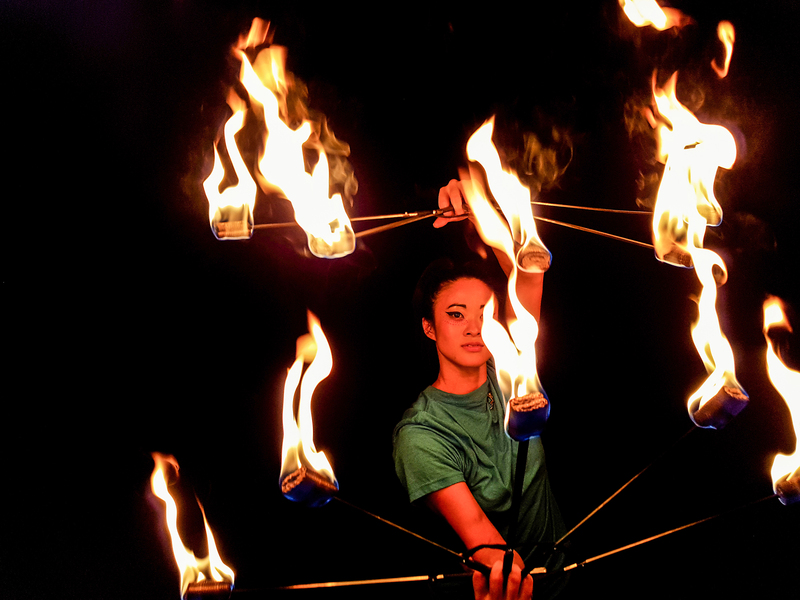 The troupe also features a number of aerialist acts, like trapeze, aerial straps and circus cubes. Bayou Cirque is organized by owners and teachers of GymFit BR, a local gym specializing in circus arts, gymnastics and functional fitness. Its leaders—David Gabel, Eric Otts, Stephanie Lee, John Scott and Erin Warner—have assembled a troupe of roughly 25 local performers with uniquely breathtaking talents. While the troupe is still in its infancy—its first official performance was in October 2017—it has performed at a wide range of events since then, ranging from large-scale conventions like New Orleans Comic Con in January to private parties and corporate events. Bayou Cirque has recently expanded its scope to incorporate storytelling and thematic performances, à la Cirque du Soleil. It performed its first such production, “Dark Circus,” at 10/31 Consortium’s Ghostly Gala fundraiser in October 2018. The show, which features 10 acts seamlessly transitioning between one another for a full hour, tells the story of two children who sneak off to see a circus. They find that the circus ringmaster has imprisoned the souls of his performers. The children must find a way to set the performers free. The success of the troupe’s first foray into storytelling has motivated it to bring “Dark Circus” to the public in the form of a full theatrical run. Keep an eye out for a repeat performance of the show this year. For now, Bayou Cirque’s performers are hard at work fine-tuning their crafts, no matter their age or occupation. One of the aspects of the troupe Gabel says he is most proud of is its sheer diversity—he’s 43 and married with three kids, while other members of the crew are high school and college students. See Bayou Cirque performing in Mid City Gras, Feb. 24 at 1 p.m., and the Krewe of Southdowns Parade, March 1 at 7 p.m. Find out more about the group at bayoucirque.com.